Today I was working late at my desk doing some paperwork in the studio when I noticed more people looking in at the images in the window. How much fun it is to hear people comment when I am there and they don't see me. I constantly rotate the images but the dog images seem to get a lot of attention. And the Bride in her pink dress. And a few Boudior images. One couple was looking at the bride in the window and I heard them say "Flash Frozen Photography - wonder what else they do?" - I opened the door, invited them in for a look and a chat. We changed business cards and I bet they'd be a lot of fun to work with. 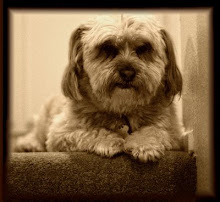 Then 20 mintues go by and the image of Max the Shih-tsu got the attention of a 15 month old. When I saw that cute little happy face (his name was Bryce) I went to say "Hi" - He was so cute, newly walking and wobbly at that so I invited him and his Dad in to see other Doggies in the studio. He was throwing kisses at me. That tugged at my heart strings! How much fun to capture the backward bye-bye of a toddler and then kisses to boot.